On Boxing Day I finished watching Dougram, a longish old anime about a small band of rebels and a prototype war machine. A fairly standard recipe for its time, distinguished in this case by understated mecha and heightened attention to politics. This is the first thing Takahashi directed (Anglophone fan-rumour has it that Takeyuki Kanda rode shotgun), and it began airing in 1981. It feels a little like an attempt to do a toned-down Mobile Suit Gundam — with which it shares a scriptwriter — though, being an anime history dilettante, I don’t know whether in 1981 Gundam was regarded as something influential, interesting or successful enough to be worth imitating. I liked it rather a lot. I’ll say why I liked it in a bit, but first I think it’s worth pausing to note the significance of my being able to finish watching it at all. Years ago, I’d heard of Dougram but never thought I’d be able to watch it. I wrote a post about the first episode in October 2008. One subtitler has been working on it, with the odd hiatus, since that autumn. Even if the subtitles were terrible that would still be impressive and, as it happens, they’re not terrible. At least, as English they’re not terrible — not knowing any Japanese, I can’t judge their accuracy, but then I never have been a stickler for accuracy. Sometimes they could do with an editor. On the other hand sometimes they read very naturally, closer to the bubble and snap of spoken English than many translations. Years ago, I’d heard of Dougram but never thought I’d be able to watch it, and one person changed that. So: hats off to this chap, who has gotten quietly on with subbing seventy-five episodes of something old and obscure for a few fans. We happy few! the Dougram foco, pushing into the unknown and cheaply animated, our way lit only by dubious subtitles and low-resolution rips, knowingly or unknowingly fighting against presentism. Maybe, though, Dougram isn’t very good. It certainly doesn’t look very good. And in some ways it’s not well-constructed. The story’s plays for our emotions tend towards mawkishness and most characters subsist on a bare minimum of backstory and development. The politicking and intrigue wouldn’t make Paul von Oberstein lose sleep, and the actual action is (from one point of view) mostly limited to miscellaneous gunfire, shots of helicopters flying along or crashing, people running around unconvincingly and a few Combat Armours battering each other like they’re brawling in a pub. Perhaps it doesn’t help that parts of Dougram‘s reputation don’t match its nature. Like its stablemate Votoms, some bill this show as a grim and gritty war story. It’s not very grim, and only moderately gritty. While there’s a fair bit of casual death, for example, important and interesting characters die very rarely. In this story war can be exciting as well as boring or terrifying. So even if you can stomach this show’s vices, you may arrive at its first episode looking for the wrong virtues. What are the right virtues, then? Here’s what I think. The plot progresses, rather than races. The mawkish, emotive elements — say, Crinn’s rebellion against and estrangement from his father — usually sit in the main action’s background, lending a little extra charge to the everyday business of fighting without thrusting themselves upon us every episode. The attenuated characterisation lets us focus on the thrilling problem-solving: how do we storm this strongpoint, how can Lecoque restrict this general’s authority? And who said characterisation was necessary anyway? Like knights and the better breed of private eye, Dougram‘s cast enter the story, do, and then leave without foisting their neuroses on us. Also, although this story doesn’t have the political acuity of Legend of Galactic Heroes or Manabi Straight (why are you looking at me like that? ), the politics is there. Lots of it has a certain ripped-from-the-headlines feel, too, there’s lots of shady arms dealing, conflicts within the military about the balance to strike between fierce counterinsurgency operations and softer hearts’n’minds stuff, that sort of thing. By the way, when the staff want to do actual newspapers, they show what are presumably contemporary 80s current affairs headlines (Arab League slams Israel over such-and-such an issue, &c) with fictional, in-universe headlines in Japanese subtitles. Now and then Dougram‘s politics will make a scene very entertaining to watch. There’s a negotiation scene, for instance, in which one side is lying, both sides know it, and they carry on anyway. It’s a frustrating charade, and it’s brilliant. Oh, and I said it was exciting, right? The Fang of the Sun scale clifftop strongpoints, make a daring Where Eagles Dare cable-car attack, are hounded through deserts by pitiless mercenaries, spring their leader from a top-security military prison, &c, &c, &c. At one point the hero says goodbye to his love interest before riding an army motorcycle down the steps of Deloyer’s chief government building and using the sloped front of an armoured vehicle as an impromptu escape ramp. If that doesn’t excite you at least a little then — and I’m sorry to have to break this to you — you have no soul. Imbibing Dougram‘s regular doses of adventure is a return to all the good bits of being twelve, those days when the Anabasis was just another adventure story like The Arpino Assignment or Biggles Fails to Return, just with Persians instead of Germans, and the occasional catamite thrown in for good measure. Although, had I watched Dougram when I was twelve, I reckon I would’ve noticed all sorts of things (as I noted, without entirely understanding them, the Ten Thousand’s catamites). How much the occupiers rely on helicopters, for instance. Or how many of them are nice enough people. The dilemmas caused by Terran investment in Deloyeran factories (and hence Deloyeran jobs) and the guerillas’ reliance on Terran profiteers for hardware. That Rick, Crinn’s brother-in-law, was rather intimidated when he found himself marrying up into a family with tentacles of influence running into business, politics and the military, things like that. None of these things are put across deftly. They are, like Dougram itself, large, crude and stomping — but nevertheless effective. And all that is, as best as I can explain it, why I liked this show so much. This entry was posted in commentary, fanboy and tagged fang of the sun dougram. Bookmark the permalink. I won’t be able to start watching this yet as I have yet to overcome my problems with VOTOMs… I think you did a great job preparing me for this show, as my expectations for VOTOMs could have used some of the temperance I got from reading this post. I resolve to finish ATVOTOMs this year, so I can begin watching this in earnest (I am 30 episodes in). I didn’t write this as a Dougram primer, as I imagine most readers won’t be interested in watching the show anyway! — but if it’s been helpful in that role, then that’s good. I wouldn’t say the same things about VOTOMS that I’ve said about Dougram, partly because Chirico’s story varies its ‘feel’ more substantially from arc to arc than Crinn’s. What I would like to do (inclination and time permitting) is write a more detailed post, with spoilers, about what I think Dougram actually does, which might expand a bit on the whole ‘what I think makes something grim and gritty’ thing. Maybe. I’m going to thoroughly employ this method when advocating shows. I think it’s simple but not quite crude, and very effective. Thanks for spreading the word that it is finally subbed I have been traveling around here and there but I’d never thought I’d see the day I had most of the early eps but good to know I can finish with out having to read a script while watching raws. Thanks for this as well. My knowledge of DOUGRAM is limited to what few bits I’ve read about it–say, in the defunct magazine “Mecha Press” and the few mentions it gets whenever VOTOMS is discussed. I did get a nice old-school model of the Dougram (which I am not giving up, no way in hell!!) and DOUGRAM, VOTOMS, and GUNDAM do share the same mecha designer, Kunio Okawara. Most Americans are probably not aware that FASA’s BATTLETECH games originally used some of the Combat Armors from the show. Then again, this was around thirty years ago (and sadly, there seems to be no effort to look back that far. But that’s just me….). DOUGRAM may have its flaws, but hell–it was one of the early shows in the “Real Robot” era that GUNDAM birthed. I’ve read a few snippets on /m/ about FASA’s use of designs from Dougram in early Battletech, but I’m fairly ignorant of Battletech in general. 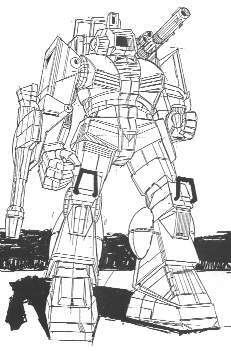 Were the designs from Dougram part of the group that had to be retired because of some complex legal situation? While we’re on the subject, another thing I’ve come across on /m/ is some pictures of a Japanese Dougram-branded tabletop game based on the Battle of Kalnock, which was nice to see. I have wondered whether Dougram‘s success, which let it run for seventy-five episodes, influenced the funding and production of other subsequent shows from the 80s real-robot boom (besides Votoms — it seems likely that Dougram helped instigate that project! ).